Celtic Rider Ireland tours are officially approved by Tourism Ireland and Fáilte Ireland. 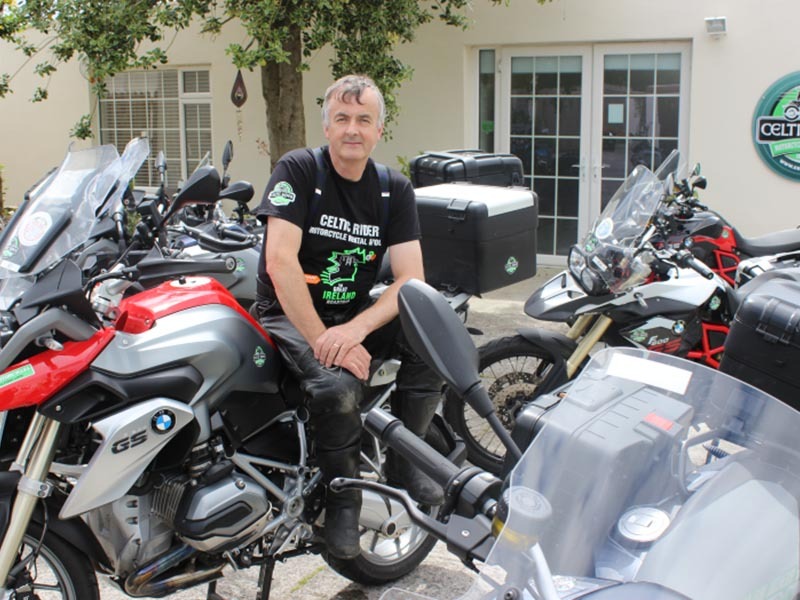 We are Ireland’s first and largest Motorcycle Rental & Touring company, now specializing in self-guided car tours. Proud Winner of National Small Firms association ‘Outstanding Small Business 2013’ was awarded to us, Celtic Rider Motorcycle Rental & Tours Ireland. We are also the winners of ‘Dublin Business of the Year 2011’. 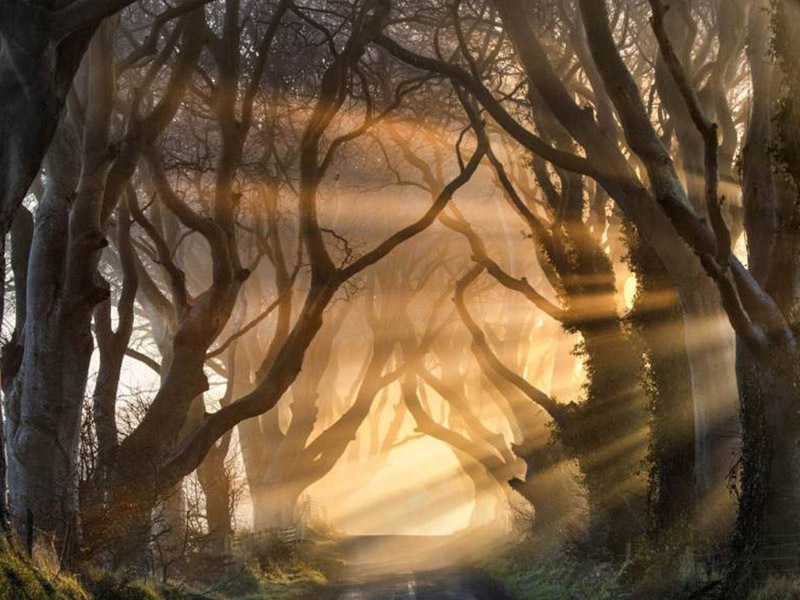 Celtic Rider’s car rental Ireland and UK, has compiled a selection of award-winning self-guided tours with fantastic daily routes, safety orientation and great accommodation included in the price. This has taken quite some effort on our part, and is an ongoing important component of the development of Celtic Rider. It really is a most wonderful option for our clients. Indeed over 80% of our turnover is now self-guided tour packages, versus hire only. We have found from our client’s positive feedback over many years, that they were extremely happy with the routes we created, which are designed to allow overseas riders to maximize their experiences each day. Our choice of quality B&B and hotel accommodation’s is exceptional as is the location of the accommodation providers in traditional towns and villages. All cars are modern, automatic, and come fitted with a Garmin Zumo 590 GPS cradle in which each day’s route is downloaded, including the addresses of all accommodation provider’s. Great days drive, not too long as Kilkenny is a great little city and arriving in the afternoon allows time to visit recommended places. Transfer to collect car(s), then enjoy our safety orientation course, both classroom and on the road along todays actual route. 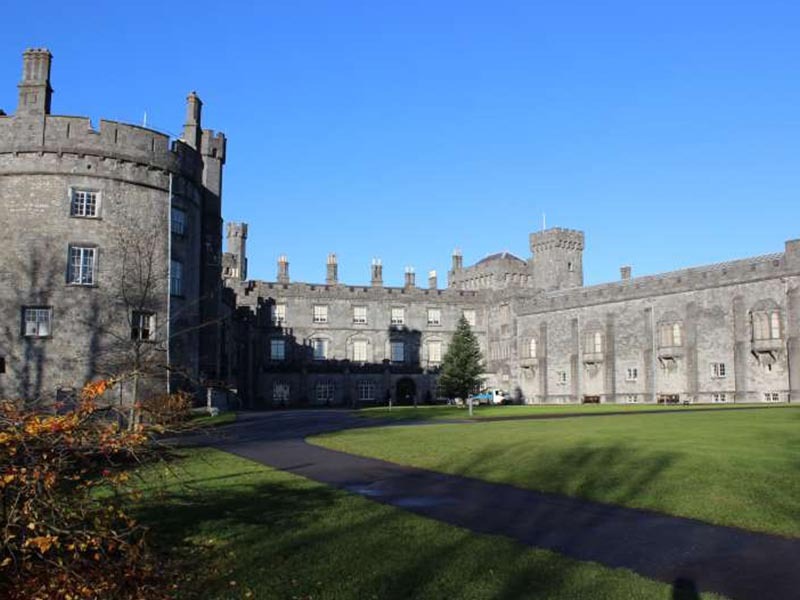 Follow the pre-programmed route to Kilkenny city via the winding rural country roads skirting the Wicklow national park, passing through the four counties of Kildare, Wicklow, Carlow and Kilkenny. Continue to Kilkenny medieval city as per the Garmin instructions. Check in to Kilkenny accommodation. 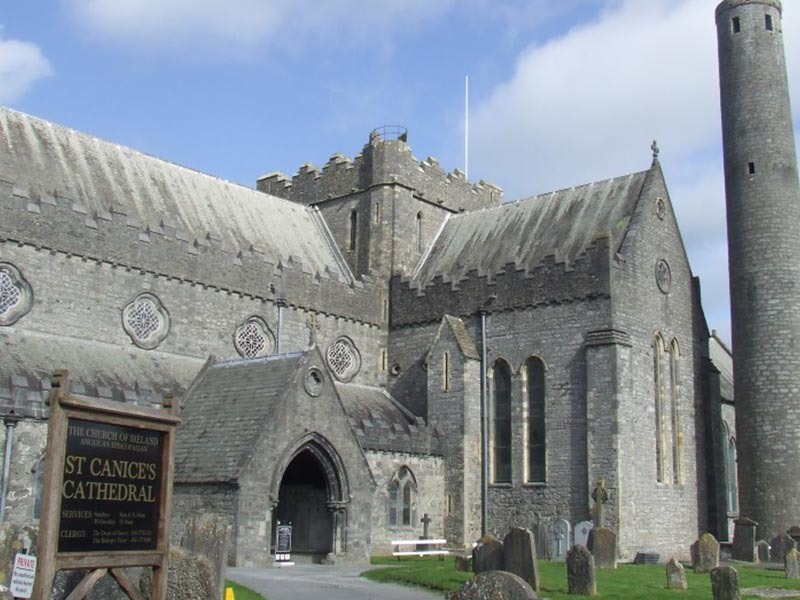 Visit the magnificent Kilkenny Castle and St. Canices Cathedral and round tower, both in the town. 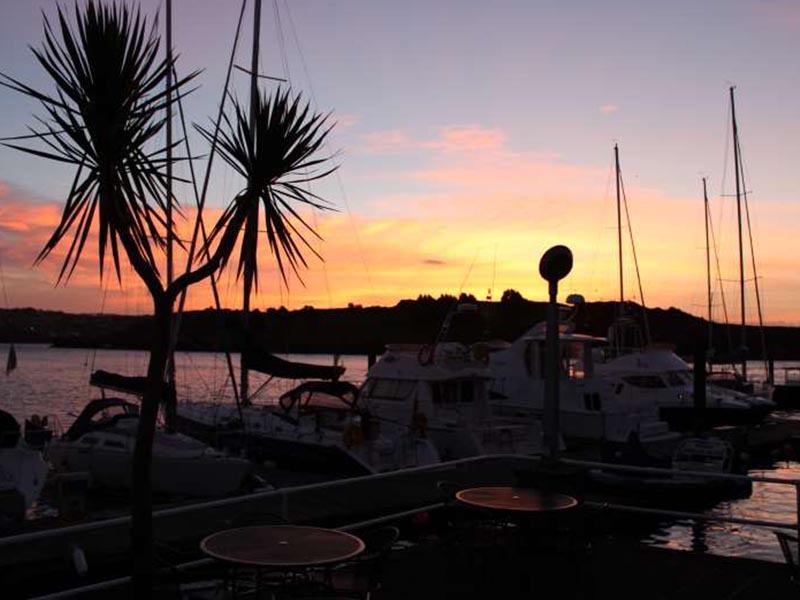 Depart Kilkenny – todays drive takes you to the beautiful coastal gourmet town of Kinsale, official start of Celtic Rider’s Wild Atlantic Way tour. Onwards through Cahir and the Cahir Castle, optional visit. Continue to Lismore and another great castle. Lismore Castle is not open to the public but the Castle gardens are and are well worth visiting. Also Lismore hotel is quite nice for food. 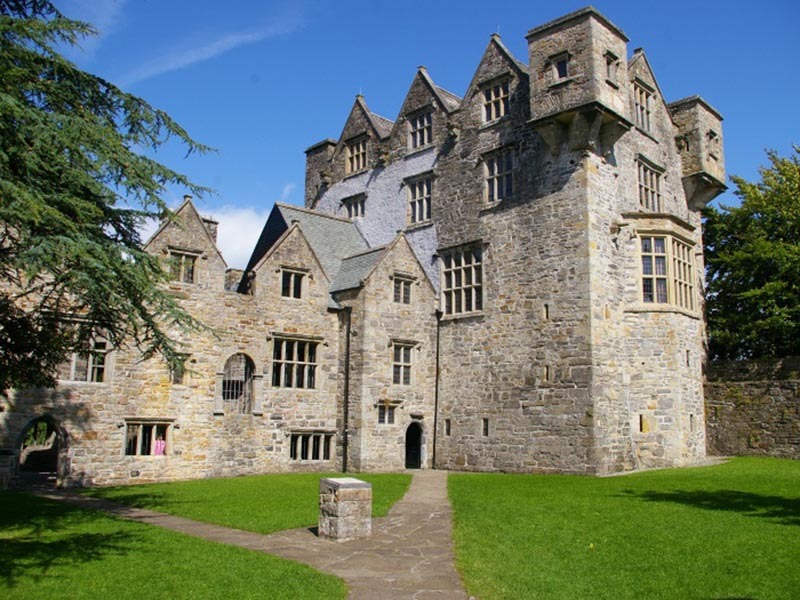 It was also the first hotel built in Ireland! 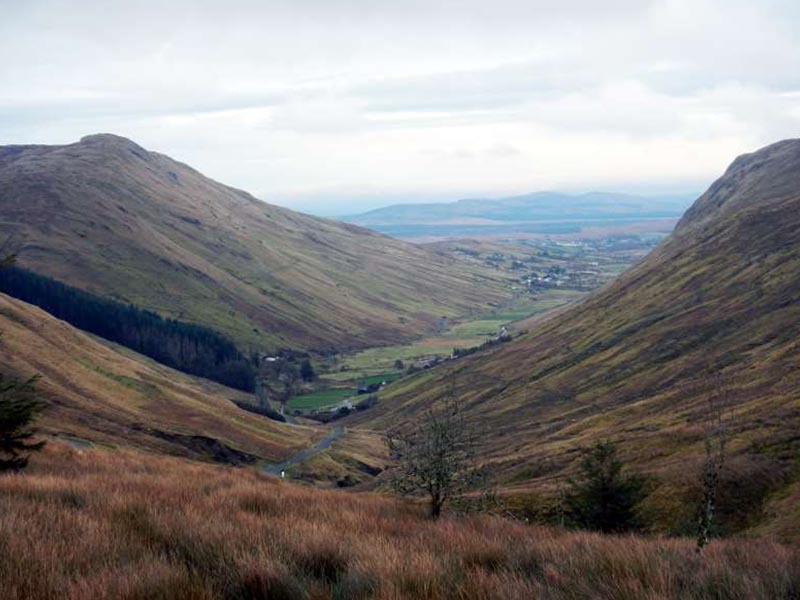 Onwards over the popular mountain pass called ‘The Vee’ with great views across 4 counties of lush Irish country side. Continue to Midleton with an optional stop at the Old Midleton Whisky Distillery. Next stop is the enchanting Blarney Castle, just outside Cork, to kiss the Blarney stone at the parapet of this great castle. The gift of eloquence is bequeathed to all who kiss this mystical stone. Departing Kinsale for Killarney. Killarney is affectionately known as the ‘jewel of the south west’. Todays drive is very interesting. First stop is Drumbeg stone circle, also known as Druids Alter, this megalithic site is 3200 years old. Onwards to Baltimore and Baltimore Beacon with great views over Baltimore Bay. Short walk to the beacon itself from the small car park, be careful not to go to close to the edge of the cliffs. Drive to the Beara peninsula, the warmest part of our island due to the warming influence of the Gulf Stream, and the amazing Healy Pass, a twisty mountain pass started to be built during the great famine years on the 1850s. 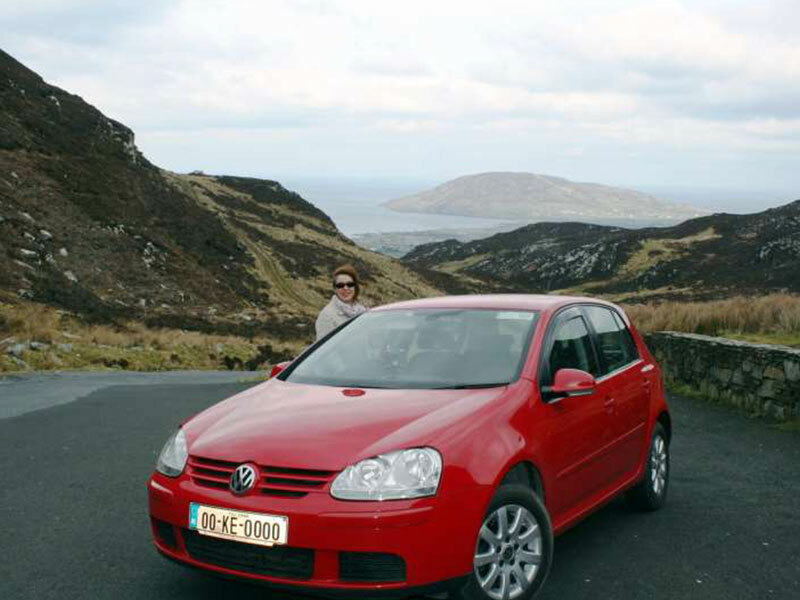 Continue to Molls gap via Kenmare, a great scenic mountain drive, then onwards to Killarney. En route to Killarney stop at Ladies View, with outstanding views over the lakes of Killarney, then Torc waterfall, short walk to the waterfall from the car parking area, its well worth it, both are saved in your Garmin in ‘Favourites’ and well sign posted too. Killarney town nestles in Killarney national Park, surrounded by majestic rugged mountainous countryside including the MacGillycuddy Reeks, Irelands highest mountain range. 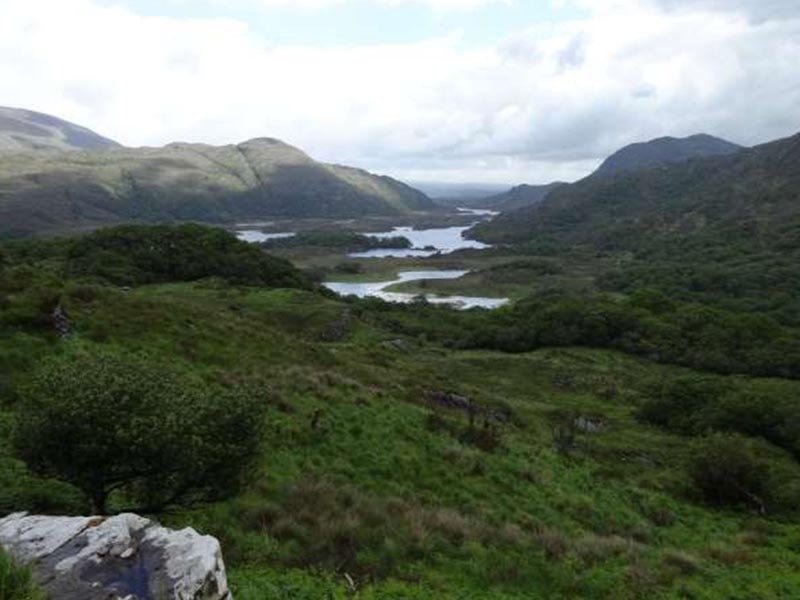 Day 4 Killarney to Killarney Rest or drive the world famous ‘Ring of Kerry’ 130 miles/206 kms. Either take a rest day and cruise the Killarney lakes taking in the majestic Mountain views and a pony and trap ride over the Gap of Dunloe, plus a bit of shopping, relax if you wish..
Continue around the Ring of Kerry, and also drive the Skellig Ring, another awesome off shoot off the main Ring of Kerry route. Drive to Dingle via Blennerville, optional stop at Blennerville windmill. Today’s drive takes passes by a famous pub called ‘The South Pole Inn’ in Anascaul, ancestral home of Tom Crean, Arctic explorer. Onwards to Ireland’s highest mountain pass, Conor Pass, with incredible ocean views of both sides of the Atlantic ocean. Be careful as streams often run across the narrow road near summit of the pass. A visit to the ‘Blasket Islands Visitor centre’ is advised. Staffed by local people, the visitor centres dotted around Ireland are all worth visiting as they educate you in the history and geography of our ancient island. Depart Dingle or Cloghane, drive over Conors pass the opposite direction, great views of inland corrie lakes from the last ice age. Follow route in Garmin to Brandon Head viewing point, stunning ocean views. very common to spot whales or dolphins from this wild place. Continue to Tarbert for the delightful ferry crossing to Killimer in Clare. Drive to the towering majestic cliffs of Moher, which is a World Heritage Site, famous the world over. Return to Doolin accommodation, optional ferry from Doolin to the base of the cliffs of Moher, unbelievable amount of wild birds nest near the base. It’s very common to see otters, dolphins and whales. Departing Doolin the drive along the coast to Murrooughtoohy and Blackhead is simply mind-blowing. Murrooghtoohy is unique in all the world, a limestone beach, part of the Burren national park, covered in millions of boulders from the last Ice age, beautiful wild orchids grow profusely among fissures in the rock, and the ocean is just a short 400 metre walk from the road, look out for this place which is saved in favourites and is only a few miles from Doolin. In Ballyvaughan village there is a nice restaurant called Monks Kitchen, nice place for refreshments. 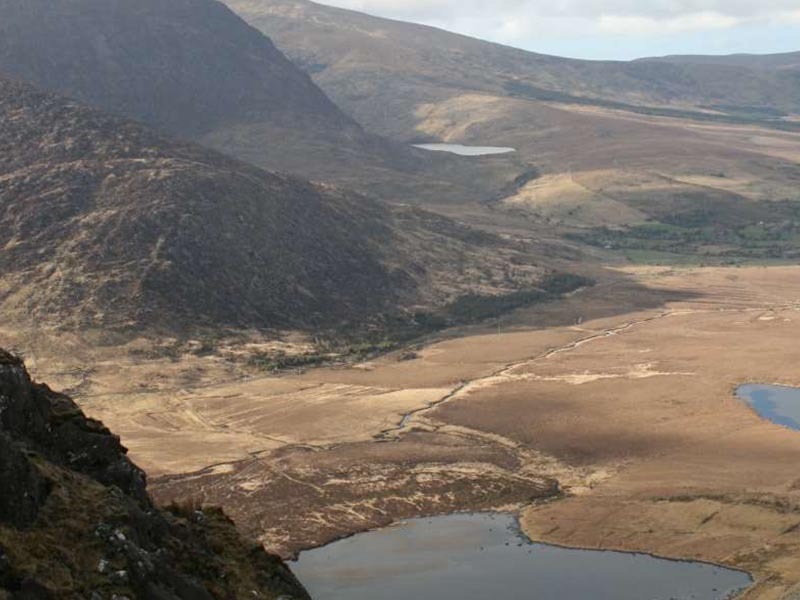 Skirting around Galway city todays drive is magical as it takes you through an ancient hauntingly beautiful landscape, a wilderness of moorland and brooding mountains, Connemara national Park. Onwards to Clifden town, nice traditional Irish town, good place to stop for lunch. 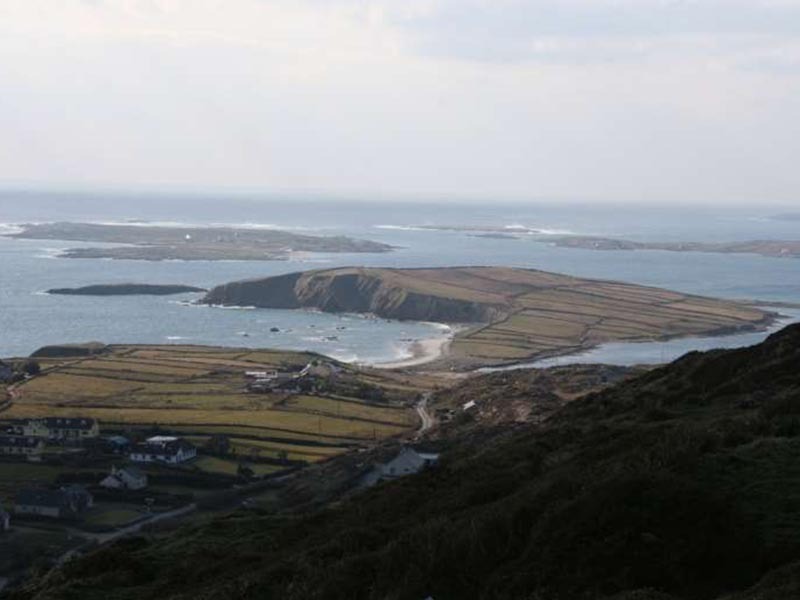 From Clifden town you will drive the aptly named ‘Sky Road’ with beautiful sea views. Next must visit place is Kylemore Benedictine Abbey, set amongst a stunning backdrop, amazing gardens and good restaurant. 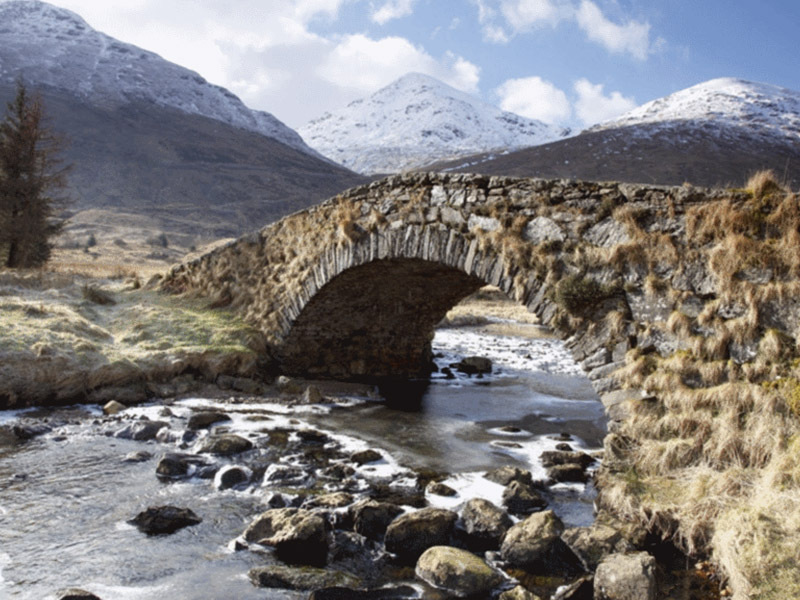 Onwards to Leenane, Irelands deepest fjord, Killary harbour, then drive the stunning Doo Lough mountain pass. Optimal rest day, hire a bicycle and ride the great western greenway, take a boat trip, alternatively drive to Achill Island, largest island off our coast. Leaving Westport for Achill island along Clew bay, first optional stop is Burrishoole Abbey, saved in your Garmin in ‘Favourites’ set in lovely quiet countryside adjacent to a still lake. 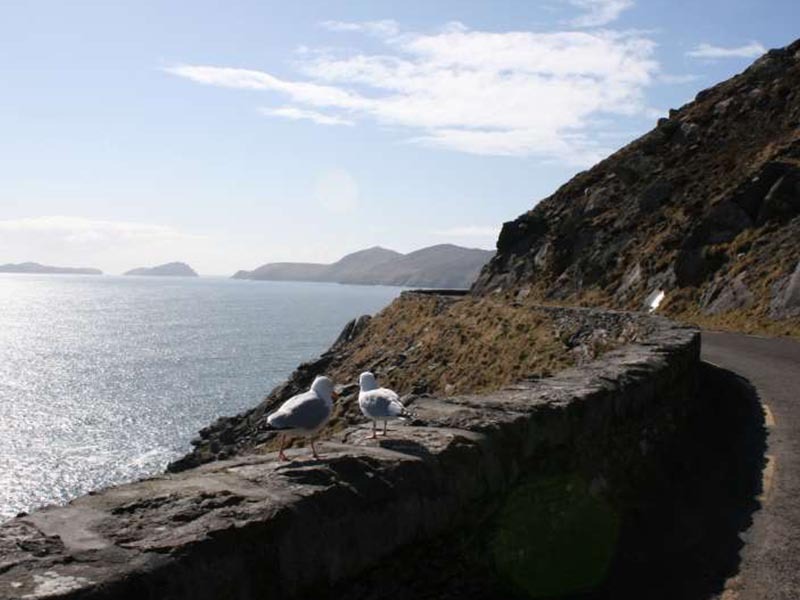 Continue along the route to Mallarranny, and on to Achill sound, then drive over the bridge onto Achill island itself. The drive across the island is very dramatic and wild, with a mix of great ocean views and mountain passes. Onwards to Keem beach, a lovely Blue star beach, ideal place for a swim on a hot summers day. Drive back to Westport for the evening and enjoy this wonderful town, voted best town in Ireland in 2012. Leaving Westport for Donegal todays drive takes you through the most remote part of Ireland, Ballycroy National Park. Please visit Ballycroy National Park visitor and information centre, like all Visitor centres in Ireland, this place is beautifully designed and staffed by local people, very willing to inform tourists about the history and landscape of this outstanding wilderness of moorland, with the Nephin Beg mountains in the distance. Visit Drumcliff burial place of W.B. Yeats, Irelands most beloved poet and storyteller. 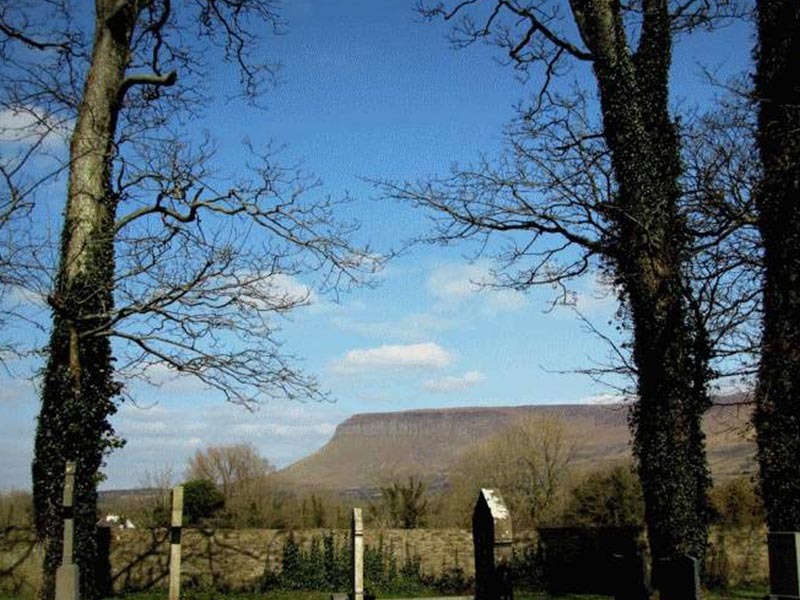 Mighty Benbulbin, a table top mountain, dominates the skyline. Today’s drive is short in distance but totally awesome. From Donegal drive to Killybegs, Ireland’s deep sea fishing port. Continue to the highest sea cliffs in Europe, Slieve League Cliffs, via Carrick, turn right 100 mts after ‘The Rusty’ Pub. The drive up is beyond memorable as it the sight from the upper car park. As this is a car tour, why not walk along the path way for a while, it is a walk you will never forget, stunningly impressive. Continue back down from the Slieve League cliffs and drive to the Irish speaking village of Glencolumbkille. Next is a great mountain pass drive over Glengash pass, some tight hairpins involved. Continue on the route programmed on your Garmin GPS to Clooney, Glenties then on to Donegal accommodation. Enjoy Donegal town for the evening. Leaving Donegal for Carndonagh on the Inishowen peninsula, we are now heading for the wild Glenveagh national park and castle. Wild Irish red deer roam freely in Glenveagh national Park, as do Golden eagles. Entering Glenveagh national park, note the towering mountains around you, most noticeable is Mt. Errigal, a quartzite capped mountain. 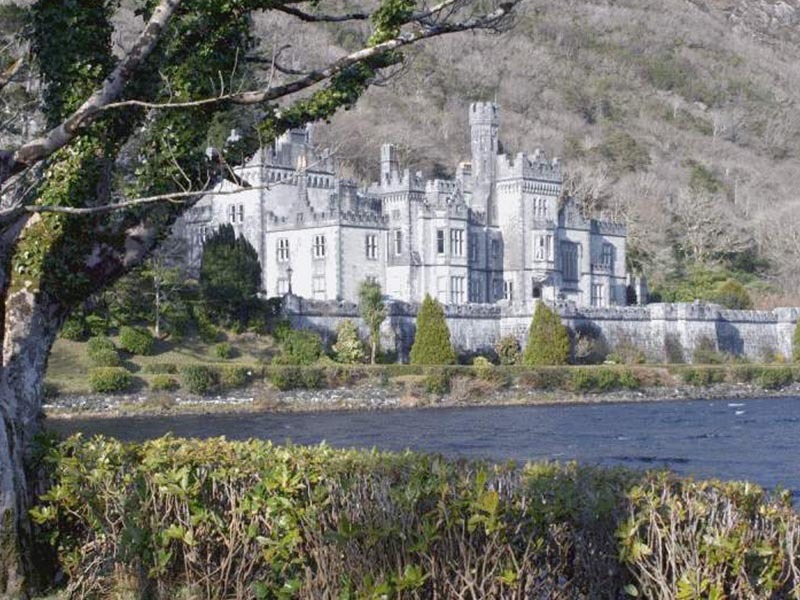 From Glenveagh visitor centre, take the dedicated mini bus to Glenveagh Castle, along Derryveagh lake, stunning castle, very interesting guided tour. Follow the route on your Garmin, first stop is 5 Fingers Strand, which hold the largest sand dunes in Europe. Continue north to Bamba’s Point in Malin head, most northerly part of Ireland, enjoy awesome sea views. Drive on to Fort Dunree, magnificent military museum towering over and overlooking Lough Swilly. Next must visit place is Doagh Famine village in Doagh Isle, an authentic small Irish village, see for yourself what life was like during the 1840s in Ireland. Drive to the north Antrim coastal causeway route in Northern Ireland via the short ferry crossing to Magilligan point in Co. Derry. Ferry crossing is on the hour and only takes 15 minutes. The north Antrim coastal drive is a beautiful drive with several stops along the route. From Ballycastle the route loops onto the coast road, Ballintoy is a little harbour with great sea views and a nice café/restaurant. Carrick-a-rede rope bridge is great fun, albeit a 15 minute walk from the car park. Next recommended stop is the ‘Giants Causeway’, touristy but nonetheless worth visiting, a Unesco heritage site. From the Giants Causeway you can drive to Derry city, optional, and drive from Derry to Carndonagh, or follow the route in the Garmin back for the ferry crossing from Magilligan Point to Greencastle on the Inishowen peninsula. Arrive at ferry for 2.5 hour crossing to Scotland, see Ferry ticket for departure time, and it is important to be at the ferry terminal at least 45 minutes before departure. Initially hugging the coast you’ll head east to the great city of Edinburgh along the route on your Garmin. After checking into your accommodation, enjoy an evening in this vibrant city. The whisky tour is good fun, and there are good restaurants and pubs in plentiful numbers. Plenty of options today, the city tour bus being one of them along with tours of the Botanical Gardens, Scottish Whiskey museums, and plenty more. Great museums and art galleries. 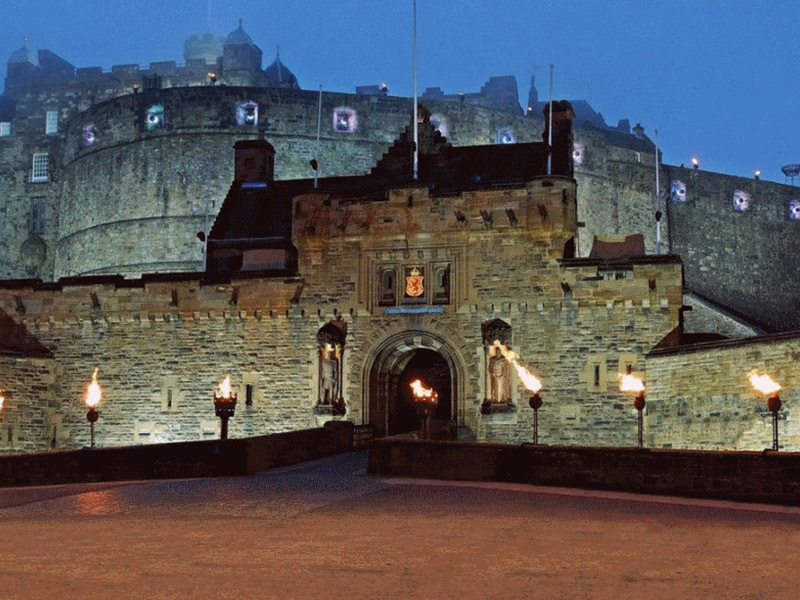 Edinburgh Castle itself, home to Scotland’s Crown Jewels. A blend of beautiful old architecture and new modern buildings, just a really nice city to relax in while soaking up the atmosphere and a joy to walk through. Departing Edinburgh for Pitlochry you initially ride over the great Firth of Forth Bridge. Today’s ride is brilliant. First optional stop is Stirling, at the monument near the university dedicated to William Wallace, a great freedom fighter and one of the most important castle in Scotland, Stirling Castle, built in the 12th century. Onwards to Lough Lomond, hugging the Lough and then into the heart of Trossachs National Park, truly a beautiful place to ride through. Continue to An Ceann Mor, located in Favourites, another optional stop here as it is a newly opened viewing area, with beautiful lake and mountain views. Continue to Pitlochry town, which is located in a most scenic, clean, fresh mountainous area. Good locally produced food is readily available in the pubs and restaurants in this quaint town. Check into your accommodation, its been a long days ride, expect an early night, or maybe not..
Onwards through Cairngorm National Park, very impressive views of the Grampian and Cairngorm Mountains. Todays route is along what is known as military roads, built a long time ago to try break the stronghold of the Scottish rebels. Narrow, twisty and sometimes bumpy, but stunning to experience. Slight detour to Grantown-On-Spey, a famous whisky distillery town. 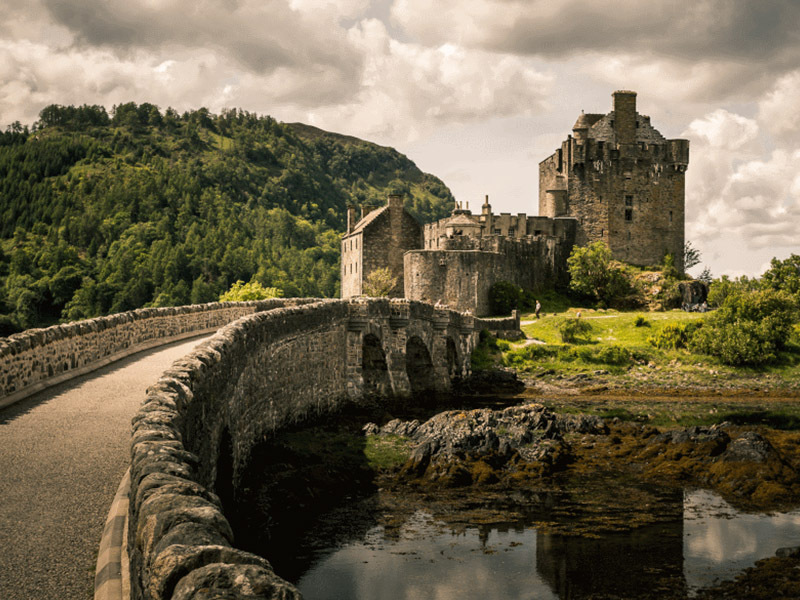 Continue to Cawdor and Cawdor Castle, enjoy their beautiful gardens and visit their locally created and produced wool products, the highlands shop and Courtyard Café. 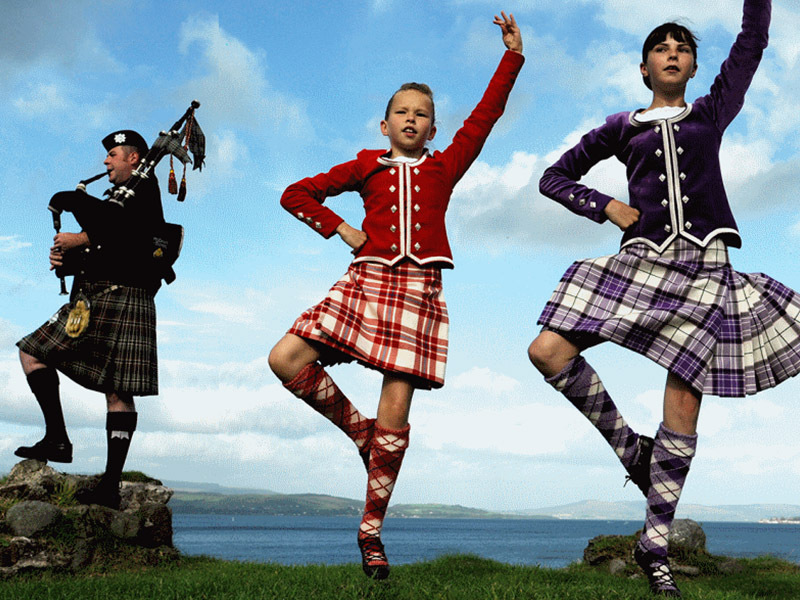 Continue to Inverness and enjoy the hospitality of the aptly named capital city of the Scottish highlands. Another amazing days driving ahead as you ride past Lough Ness and the famous Urquhart castle. Today’s drive heads to Invermorrison than on a westerly direction to the coast, and beyond..
Onwards to Portree town, coastal village, located on the Isle of Skye, part of the inner Hebrides island. Accessible by bridge. 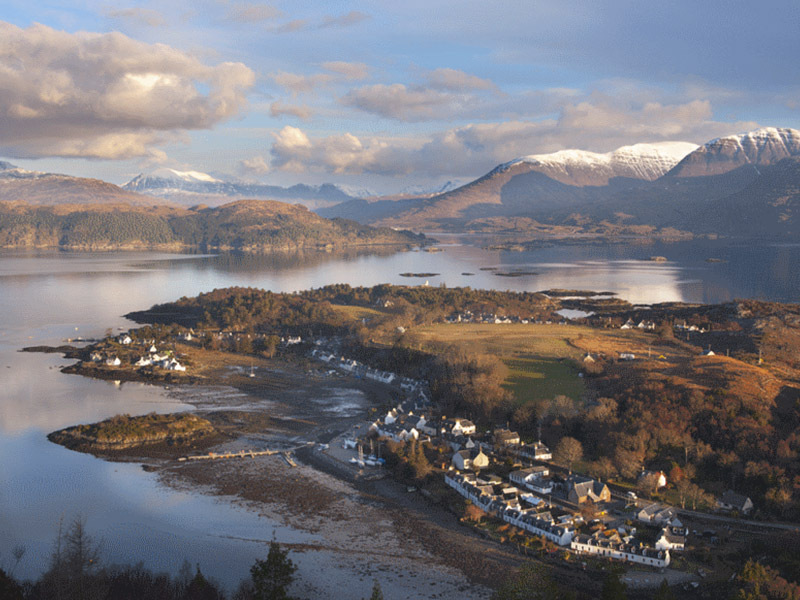 This is remote and tranquil, a Gaelic stronghold for many centuries, stunning landscape indeed.. Check into accommodation and relax in this old tranquil place. Depart Portree; first optional stop for a truly excellent photo opportunity is at ‘Eilean Donan Castle’ remember ‘The Highlander’ film! Continue along the route in your Garmin to the Five Sisters Mountain Range. Onwards to the Glencoe area, lovely scenery through this mountain pass area. Onwards to Oban, busy town, great seafood restaurants as the town has a long history of fishing..
Oban is a coastal town with a wide selection of cafes, restaurants and optional boat trips. It also has an old single malt whisky distillery from the late 17th century. The route starts off by going in the opposite direction for a short while of the previous day. Departing Oban the ride today takes you to the cosmopolitan city of Glasgow. 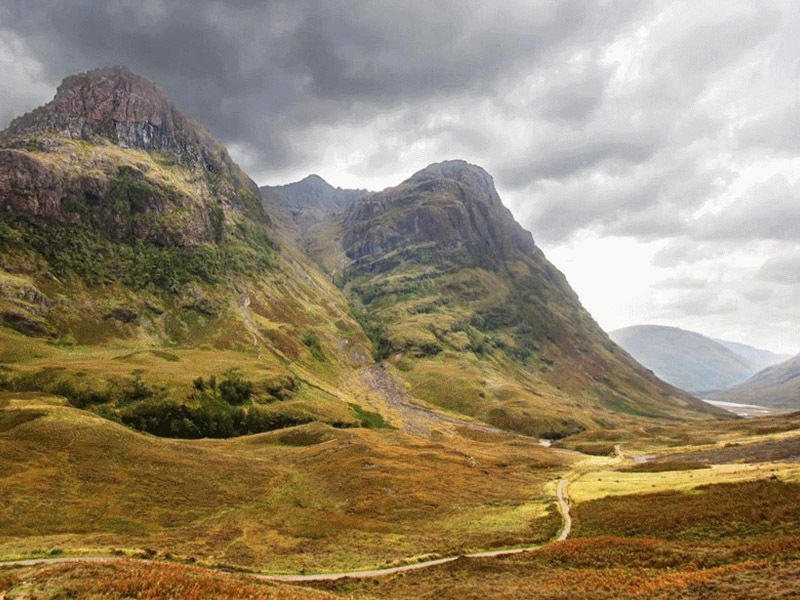 More wonderful scenery is in store today as the route cuts initially through Glencoe national park, an outstanding place of mountains and valleys, than skirts Loch Lomond and Trossachs national Park. 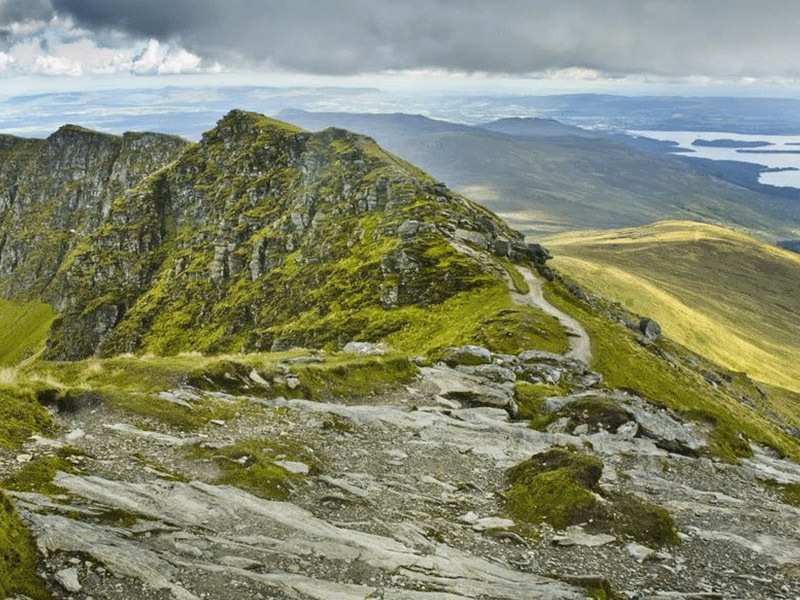 Loch Lomond is huge, the largest inland body of water in the UK. Arriving in the old city of Glasgow, which in relatively recent years has become a vibrant European city, you will notice straight away its stunning architecture. Check into accommodation and enjoy the diverse rich night life and bars of this Victorian city on your last evening. On arrival in Belfast port around 1.50pm, ride back to Celtic Rider , approximately 110 miles, 2.5 to 3 hours. Optional stop for lunch, we have no problem with late arrivals back to Celtic Rider on these days due to the ferry crossing etc.